The real Thanksgiving is best celebrated with friends and/or family. With my luck, I had a long weekend full of food with the aforementioned parties. Scheduling worked out perfectly so I could attend a Thanksgiving dinner at The Cascade Room who were hosting a special event at their UK-style pub in Mount Pleasant. I last visited The Cascade Room for its annual Barbarian's Feast so I was excited to check out a more traditional-themed event last weekend. Disclosure: I was given a complimentary food pass for the meal. All opinions are my own. Ordering the 3-course a la carte would have been $42 but as a set meal, went down to $35. The cognac brulee was the feature cocktail of the night and was made with Mery Melrose cognac, caramelized pear puree, cinnamon, nutmeg, ginger, and garnished with a candied pear crisp. This cocktail had a warm soul-warming taste with just the right amount of bite to keep it interesting. If there was a Thanksgiving cognac version of a whiskey sour, this might be it. I most enjoyed this cocktail with the main course of turkey. Moving onto some food, I started off with the fire-roasted tomato soup. Served with a scoop of brioche croutons, this tomato soup was as hearty as they come. Each heaping spoonful featured a full-bodied (read: creme fraiche-infused) slurp of tomato goodness. I had no problem scraping the sides of the bowl in an effort to clean my starter. The main event came with the traditional Thanksgiving dinner. 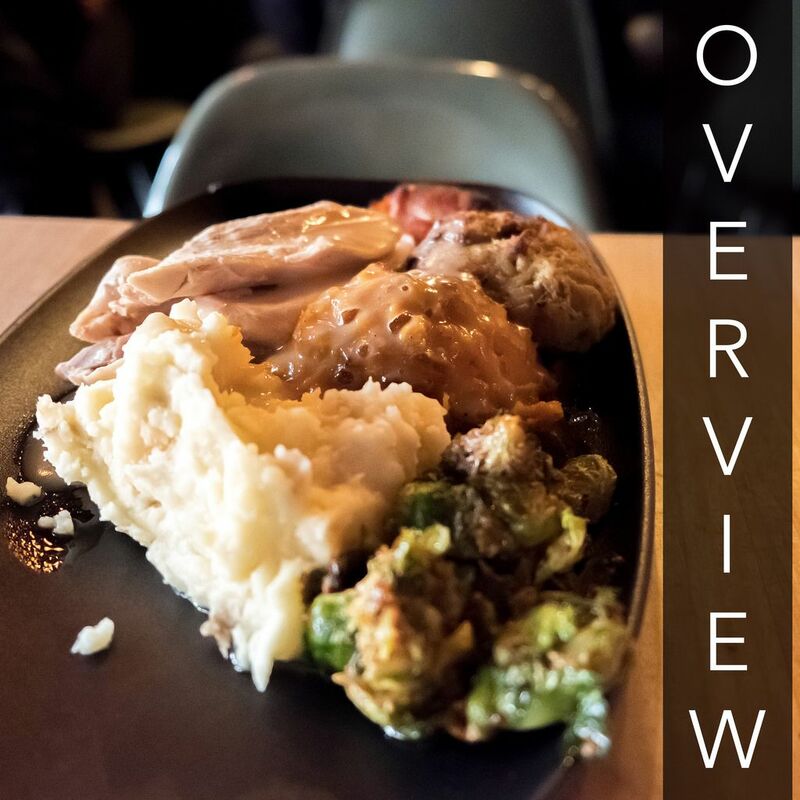 Featuring free-range turkey, sage and onion stuffing, bacon wrapped sausage, candied yams, mashed potato, brussels sprouts, turkey gravy, and cranberry sauce, this was essential turkey with all the fixings. Presentation-wise, this was a hearty plate that delivered on sheer volume (observe scoops of both mashed yam and potato). The stuffing had a creative spin on it as it had a biscuit-like bite to it. Most importantly, the turkey was cooked just right, timed correctly, and cut into lean slices with bit of juicy fat to each slice. I was basically stuffed after this turkey so I activated my secret dessert stomach. Last but not least, pumpkin pie. Served with a dollop of chantilly cream, this was a classic dessert for a traditional Thanksgiving. As I cleaved my fork through the poured pumpkin just managed to hold its shape as I transferred pie from plate to mouth. I personally prefer a crustier texture on my crust but the cookie dough-like crust on this pumpkin pie would have been perfect for diners who are partial to soft desserts. The Cascade Room (friends with El Camino and The Union) is a UK-style pub with a gigantic bar, a dedicated projector for games/shows, and a variety of seating amongst booths, high tables, and dining tables, fitting over 100. The vibe inside is on the chill side with candles lighting most tables in the evening and spotlights on the live band playing in the back. The high table we were at featured a single hook for hanging bags.